It's Labor Day here in NE Ohio, and I'm being lazy. 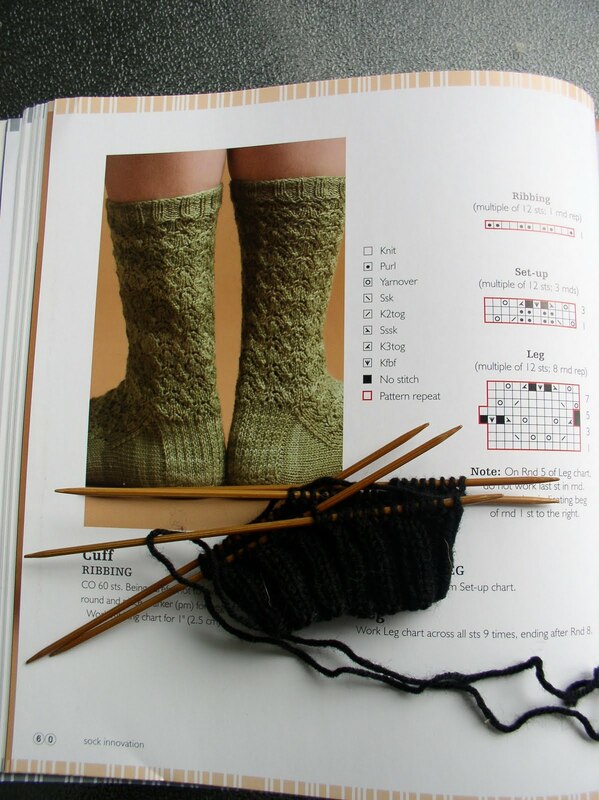 That implies that much knitting is happening, as well as some TV watching. There will be a cookout with family later. Much knitting has been finished recently. Small projects get done quickly. There were the Fiesta Feet. I doubted my sanity at times during the knitting, but soldiered on and they're done. 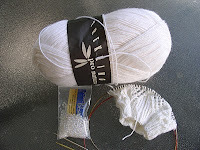 Both yarns are Kroy 4 ply sock yarn. They were originally designed with a light colored solid. I had some, but used it for some other socks and couldn't find a comparable substitute. 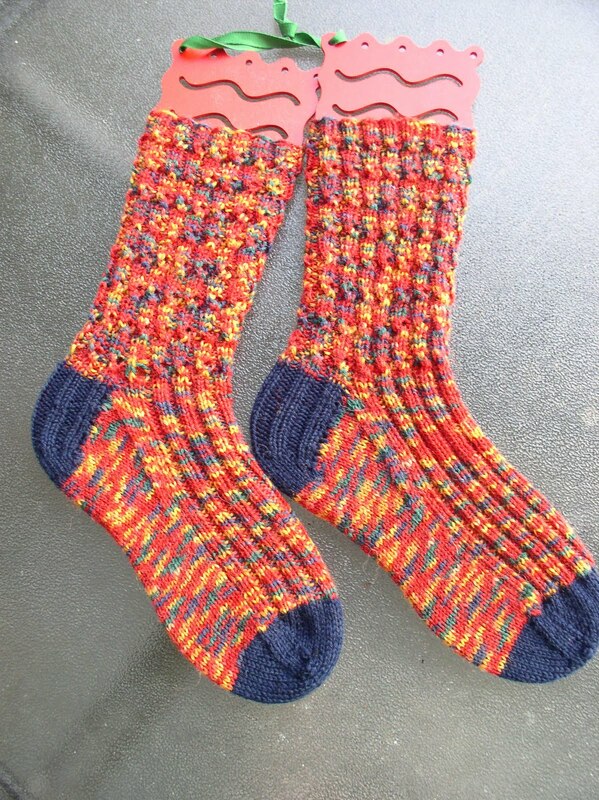 The leftover from these socks went to DGD Ana for her birthday. There was just over 1 ball of the paintbox color. 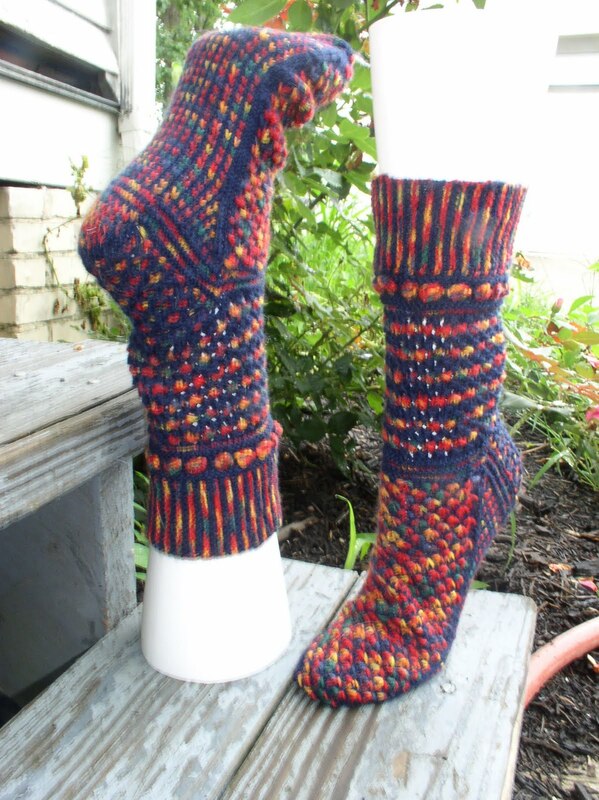 All but 1 yd went into the socks. No leftovers to worry about there. I used a pattern from a book by Janel Laidman, called the Eclectic Sole. We collect books and patterns and don't use them, especially if you're a designer. This year I'm trying to use some of what is on my shelves. 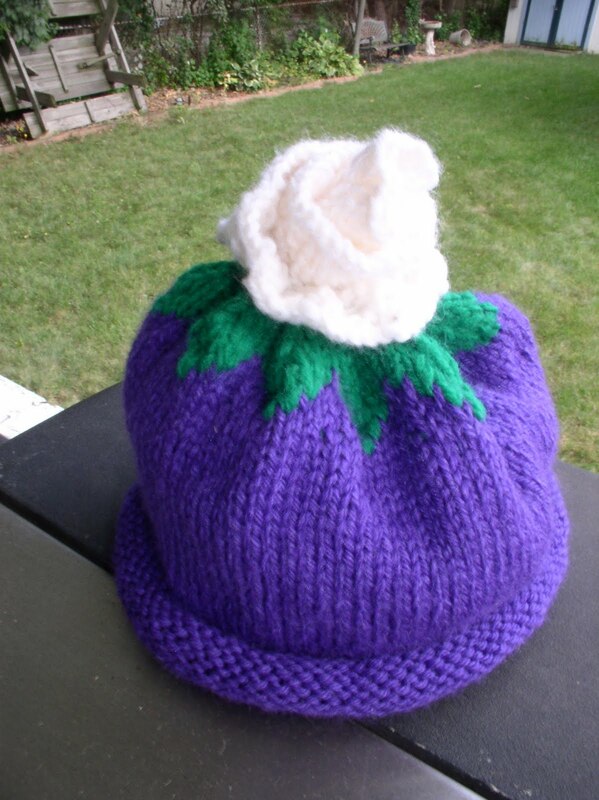 The tomato hat will be mailed with a hat for big sister Rayven. 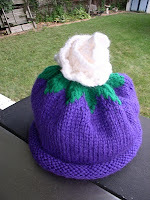 The base hat is a fruit hat, like the tomato, but I put a rose on top from Nicky Epstein's Embellishment book. I loved the yarn from the Swiss Cheese Scarf and had a lot leftover. A sweater for me is on the needles. It will have short sleeves and is lacy, which doesn't show here. 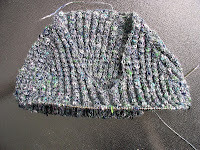 If I can't finish it in the grey tweed, I have a few choices of matching yarn. 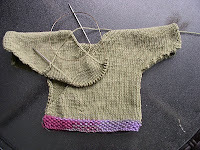 Green is my first choice, possibly a lace edging and crochet edge on the neck. 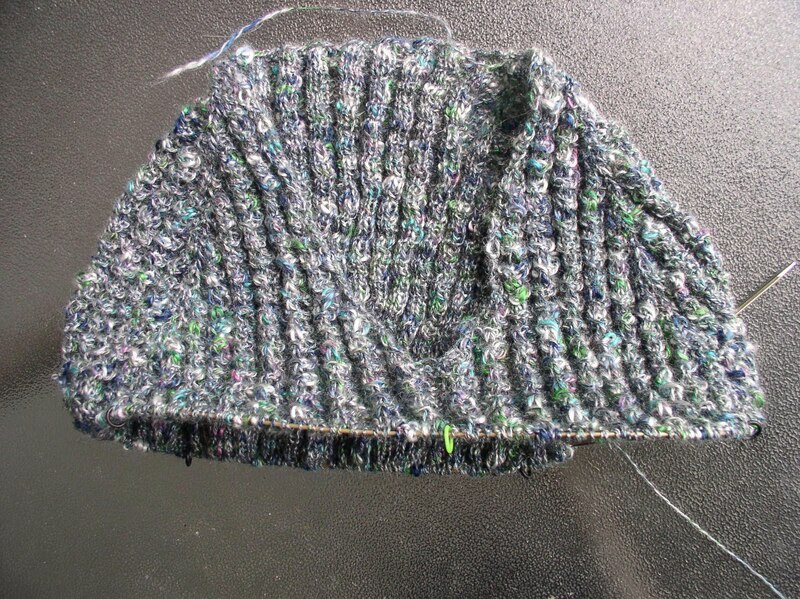 A simple project, now that the hats are done, is a baby sweater for the gift drawer. All the girly sweaters were used up this spring. This is a simple one-piece kimono from dish cloth cotton, left over from my jacket. The pattern is in Mason-Dixon Knitting, which calls for this yarn. Of course, there are socks! 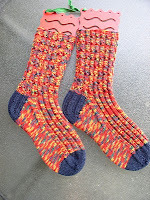 There is the Ravelry SKA Mystery Sock; clue #1, sock #1. 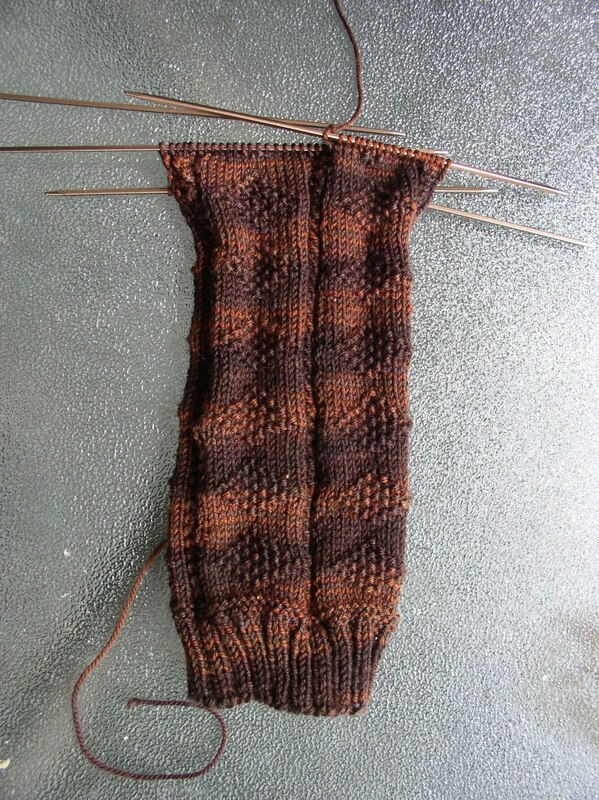 The Ravelry Solid Sock group has chosen brown for this month. I have a Ram Club pattern from last year that is for DH. Yarn substitution was required, because the given yarn didn't have enough yardage. Hopefully this Hazel Knits sock yarn will cover both toes without additions from the scrap drawer. I love the depth of the color and the pattern really pops. The SKA group also has a color of the month for September. It is white, or black, or black/white. 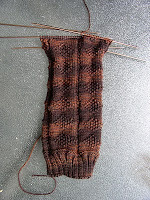 A pair of socks for DGD Luci has been started in black. I'm using a Cookie A pattern from her Sock Innovations book. Last Wednesday i judged needlework at another fair. This time it was Geauga County, the oldest fair in the state. The building I worked in was rebuilt in 1899 after a fire. Lots of good entries. It's harder to choose the best, but I feel better about it. There were only a few items int he wrong class. Sometimes people don't read, and sometimes they may mix up the tags on entry day.